The next three countertop ovens are the lowest priced in this review. Only one of them is a convection oven, but all of them have special features. These lower priced countertops range in price from about $150 to $200. One of the newest countertop ovens is a DeLonghi America EO241250M Livenza Digital, you can see this model now at Amazon here. DeLonghi is an Italian appliance manufacturer that introduced this oven into the US market in 2016. 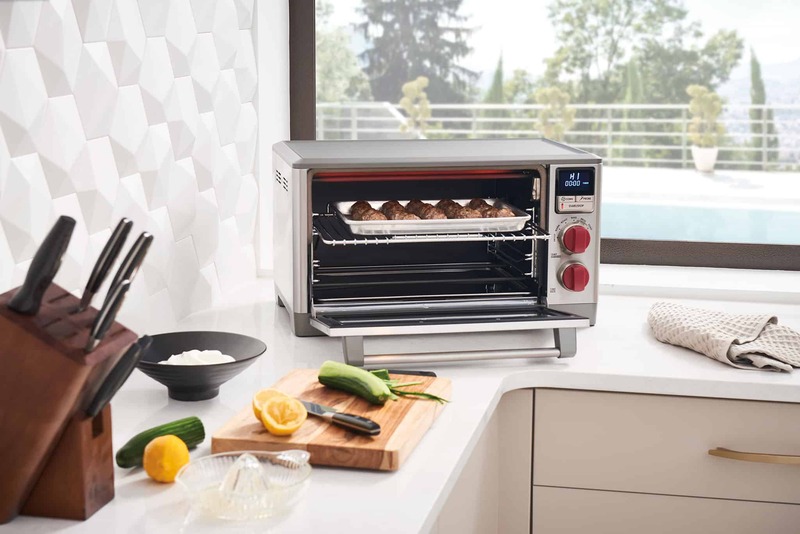 This countertop oven provides about 0.5 cubic feet of interior space, in 7 modes, including Dehydrate, and convection cooking. The DO1289 has eight cooking functions and is even designed to allow two pizzas to be cooked at one time (great if you’re having a crowd). You may also cook other food on each of the two oven racks at the same time. This oven has heating elements in the top and bottom of the oven and includes an oven light. There are a lot of accessories with the DO1289. These include: (1) a bake pan, (2) a broil tray, (3) two wire racks, (4) two cookies sheets, (5) a dehydrator kit and (6) an aluminum pizza tray! That’s a lot of accessories. DeLonghi has also developed their own patented coating system, the “Durastone II” system. This enamel coating is designed to protect the oven interior from high heat and damage. It is also designed to make cleaning up the oven really easy. This mode uses the convection fan to cook evenly, even when cooking on two racks at the same time. This mode allows you to cook at temperatures between 200 and 450 degrees Fahrenheit. Note, however, that you can only set them in increments of 25 degrees Fahrenheit. So, the possible temperature settings are 200, 225, 250, 275, 300, 325, 350, 375, 400, 425 and 450 degrees Fahrenheit. You can manually set cooking time anywhere from one minute up to a maximum of 2 hours. (1) either reduce the temperature of a non-convection recipe by 25 degrees Fahrenheit, about 10 degrees Celsius. Or, (2) reduce the non-convection recipe cooking time by 25% when you are cooking with the convection fan on. Once set, the oven will preheat and alert you when the temperature that you set is reached. You can easily change you cooking time or temperatures during the cooking cycle. You do this by turning the Time/Toast Color dial or by pressing the Temp/Select/Clock button. The Defrost function is also a part of this mode. This function is designed to defrost almost anything you can fit in the oven, for up to 2 hours. Note: To use the Defrost function of this mode, press the Temp/Select/Clock button until the snowflake icon and “dEFr” is displayed on the LCD. You may then choose a Defrosting time from 1 minute to 2 hours. The default Defrost time is 30 minutes. Press the Start/Stop button to start the Defrost cycle. This mode is the conventional, non-convection, cooking mode for using the heating elements on the top and bottom of the oven to evenly cook lots of different foods. This mode has the same temperature and time settings as the Fan & Bake/Defrost mode. Those are between 200 and 450 degrees Fahrenheit in 25 degree increments. Cooking times can be set from 1 minute to 2 hours, maximum. Cooking time may be extended by rotating the Time/Toast Color dial. Temperatures can be changed by pressing the Temp/Select/Color button. These adjustments can be made during the Bake cycle. This mode is used to sear food placed in the top rack position at high heat. This cooking method is great for cooking open faced sandwiches, or anything else that needs a good sear. This mode is also designed to be used with the included broil rack inserted in the bake pan. You may set the broil time from 1 minute up to 1 hour, but you cannot change the broil temperature, it is pre-set. The default broil time is 15 minutes. Just turn the Time/Toast Color dial to change the broil time, you can change it during the broil cycle if you’d like. This mode is designed to crisp the exterior of sliced bread on both sides, but leave the center soft. Toast is designed to accommodate from 1 to 6 slices of toast on one oven rack. Just press the Temp/Select/Clock button until the number of slices you want to toast is indicated on the LCD display. The display will cycle from 2 to 4 to 6 slices, the odd numbers of slices will not be displayed. You may also choose the level of “darkness” or toast color for your toast by turning the Time/Toast Color dial. You may choose toast colors between 1 (lightest) to 7 (darkest). Once you’ve made your selections, the cooking time will be determined automatically based on those settings. Cooking time will also adjust based on the internal temperature of the oven. The warmer the oven is the shorter, the cooking time. You can stop the cycle at any time, just press the “START/STOP” button at the bottom of the control panel. This mode is designed to cook up to two fresh or frozen pizzas at the same time. This mode includes six sub-modes to more ideally fit cooking times and temperatures based on the size of the pizza you are cooking and whether you are cooking 1 or 2 pizzas. After you’ve selected the Pizza mode, just press the Temp/Select/Clock button to cycle through each of these sub-modes. The sub-modes are P1 through P3 for single pizza cooking and 2P1 through 2P3 for two pizza cooking. P1, or 2P1 is for pizzas between 6.5 ounces and 9 ounces, P2, or 2P2 for those between 9 and 18 ounces and P3, or 2P3 for those pizzas larger than 18 ounces. This mode is designed to preserve food by removing moisture from food with the convection fan. Fruits and vegetables are typically dehydrated, but other kinds of food may also benefit from dehydration. This mode is designed to be used with the included dehydrator kit that consists of two racks fit one on top of another. The dehydrator kit should then be placed on one of the oven racks positioned in the lowest rack position. To start, select the “Dehyd” with the mode knob, “deh” will then be displayed in the LCD. You may use the Time/Toast/Color knob to select the Dehydrate time, anywhere from 8 hours to 14 hours. This mode is designed to cook either one or two racks of cookies, cakes, pies, brownies or similar foods. You cannot change set the temperature in Smart Cookies mode, just the cooking time. To get started with this mode, set the mode knob to “Smart Cookies”. Once this mode is selected, the LCD will display “1 tr” for one tray or rack of cookies. To select two trays or racks, press the Temp/Select/Clock button until the LCD displays “2 tr”. Once selected how many racks will be used, press “START/STOP” to start cooking. Use the Time/Toast Color dial to change the cooking time as needed. This mode is designed to keep your food at a safe temperature (180 degrees Fahrenheit) after you’ve cooked it. To select this mode, just rotate the mode dial to “Keep Warm” and the LCD will then read, “180*F”. What Else About The DO1289? The crumb tray slides out from the bottom of the oven. Interior dimensions are: about 10 inches deep, 12 inches wide and about 7 inches high, or about 0.50 cubic feet of interior space. Exterior dimensions are: 15 1/2 inches deep, 19 inches wide and about 9 1/2 inches high. The DeLonghi DO1289 weighs about 19 pounds. 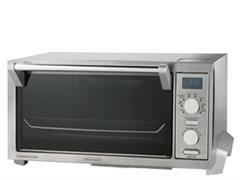 This is a great little oven with a lot of interesting functions, including dehydrating and even the ability to cook two pizzas at once, all with convection cooking. To see this DeLonghi DO1289 on Amazon including extended warranty options, click here. We recommend buying an extended warranty with this DeLonghi oven since the warranty offered by DeLonghi is only 1 year. The Breville BOV650XL Compact Smart Oven is another quality Breville product. It is larger than the BOV450XL (see below) and smaller than the Breville Smart Oven Pro (see above). If want you to skip straight to the Amazon store to buy this oven click here. This oven has 8 cooking modes and 1,800 watts of power. Like all of the other Breville ovens reviewed here, the BOV650XL includes the Element IQ system. This system is designed to work with each of the oven’s four quartz cooking elements to for best results based on the cooking mode, time and temperatures that you set for your oven. This stainless steel oven with non-stick interior can even accommodate a 12 inch diameter pizza. Note that this oven is not a convection oven, it does not have a convection fan. The Breville Compact Smart Oven features two optional buttons that each work in select cooking modes. The first is the temperature conversion button, indicated by “PRESS TEMP.” text, then “F/C” inside the button. Press this button to switch from Fahrenheit (the default setting) to Celsius, and back. This button is also useful in converting temperatures from one standard to the other. Just enter the temperature in either Fahrenheit or Celsius. Then press the button to switch to Celsius or Fahrenheit, and the LCD will display the converted temperature. You can tell which mode you are in by looking at the LCD display which indicates either “F” for Fahrenheit or “C” for Celsius. The temperature conversion button works in Bake, Roast, Broil, Reheat, Pizza and Cookie modes. The other optional button on the front of the oven is the frozen foods button, indicated by the “PRESS FROZEN” text and a snowflake icon on the button. The frozen foods button adds additional cooking time to account for frozen food. It adds time appropriate for the cooking mode that it is operating in. It works in Toast, Bagel, Bake, Cookie and Pizza modes. In Pizza mode note that it is the default setting, but can be de-selected by pressing the frozen foods button. You would likely want to deselect the frozen foods button when cooking fresh pizza. This mode is designed to use all four heating elements for even cooking pot pies, cakes, frozen foods like lasagna, brownies and similar foods. Bake mode generally works best for food placed in the center rack position, but you may need to choose the lower or upper positions based on the size of the food. The default temperature for Bake mode is 325 Fahrenheit. You may choose any temperature you want by pressing the Temp/Time button until the preset temperature of 325 F is displayed on the LCD screen and then rotating the dial. You may choose between 120 degrees and 450 degrees Fahrenheit, or between 50 and 230 degrees Celsius. The default Bake time is 30 minutes. To change it, press the Temp/Time button until “30 MINS” is displayed on the LCD screen. Then just rotate the dial to choose Bake times between 1 minute and 120 minutes. This mode is designed for cooking dense foods like thick cuts of meat. It is designed to use all four heating elements to thoroughly cook the interior of the food while crisping the exterior. The recommended rack position in Roast mode is the bottom position. The default temperature is 350 degrees Fahrenheit and the default cooking time is 1 hour. To change these settings, just press the Temp/Time button until your choice of the default temperature or default time appears on the LCD display. Then simply turn the dial to the right to increase time or temperature, or to the left to decrease either. The range of temperatures available for you to set is between 120 and 450 degrees Fahrenheit or between 50 and 230 degrees Celsius. The options for cooking time in Roast range from 1 minute to 2 hours. Once you’ve made your temperature and time setting, press Start. The oven will then preheat, indicated by the flashing “PREHEATING” display on the LCD. When the temperature set by default or by you is reached, the audible alert will sound to alert you to place your food in the oven. The timer will then start for whatever time is set. Once the cooking cycle has finished, the audible alert will sound three times, indicating that cooking time has expired. You can stop the Roast cooking cycle or any cycle at any time. This function is designed to deliver high heat from the top two heating elements to sear your food with a lot of cooking power and low power on the lower heating elements. You can broil all kinds of meat, fish, open faced sandwiches, even vegetables easily with this oven. The included enamel broiling rack should be used in Broil mode and it is suggested that you use the top rack position in Broil mode. There are only two temperature settings in Broil mode, “HI” and “LO”, the default setting is “HI”. To change between “HI” and “LO”, press the Temp/Time button until the default “HI” setting is displayed on the LCD screen, then turn the dial to change the setting to “LO” or leave it at “HI”. The default time setting is 10 minutes. To change it, press the Temp/Time button until the “10 MINS” are displayed on the LCD screen. Then turn the dial left for less time down to 1 minute or to the right for more time up to 20 minutes. NOTE: Turn your food over half-way through the Broil cycle if you want to crisp both sides of your food, or to more evenly cook it. This mode is designed to use each of the four quartz heating elements to heat refrigerated food without crisping or searing it. It is meant for heating up leftovers. The default temperature in Reheat mode is 325 Fahrenheit and the default time is 15 minutes. To change the temperature or time, press the Temp/Time button until the default temperature or time is displayed in the LCD screen. Rotate the dial left or right for decreasing or increasing time or temperature. You may choose a temperature from 120 to 450 degrees Fahrenheit or from 50 to 230 degrees Celsius. Cooking times may be adjusted from 1 minute to a maximum of 1 hour. This mode is designed to use all four elements to brown sliced bread on both sides equally in the center rack position while at the same time leave the center of the slice warm but soft. In this mode, you choose the “Darkness” or browning level that you want for your toast in place of a temperature setting and also choose the number of slices in place of cooking time. The Element IQ system will automatically adjust cooking time once you choose the “Darkness” and number of slices. The “Darkness” levels are 1 (lightest) to 7 (darkest) and slices from 1 to 4. You should probably experiment with these settings since sliced bread comes in so many varieties and sizes. Once you’ve found the right settings, the oven will remember them so they can be used without having to change them each time. The default setting in Toast mode is “Darkness” level 4 and 2 slices. To switch between “Darkness” and the number of slices, use the Temp/Time button, pressing it until either “DARKNESS” or “SLICES” is flashing on the LCD screen. To change these settings from the default settings, just turn the dial left or right to decrease or increase darkness or slices. Once you’ve entered your settings, press the “START/CANCEL” button. The LCD will then display the cooking time calculated by the Element IQ system to match your settings. Element IQ also adjusts for the internal temperature of the oven, whether the oven is warm or cold, the system will shorten or extend cooking time. It’s fun to guess to see if you can accurately predict the answer provided by Element IQ. This mode is designed to toast the top of bagels, thick bread slices or even artisan bread. It is designed to only toast the top side of any type of bread. It is best to use the center rack position and provide high heat to the top elements and low heat to the bottom elements. If you prefer your bagel or other bread toasted on both sides, then use the Toast function. Like the Toast function, the Bagel function uses “Darkness” and number of slices instead of temperature and time settings. You may choose “Darkness” levels from 1 to 7 and slices from 1 to 4. The default setting is Darkness level 4 and slices 2. Use the Temp/Time button to change the default settings. When you press the Temp/Time button in Bagel mode, the LCD indicator for either “DARKNESS” or “SLICES” will begin blinking, indicating which of the two settings you can change. If you need to switch to the other setting, press the Temp/Time button again. Once you’ve selected which setting you want to change, just rotate the dial to the right to increase “Darkness” or slices. Turn it to the left to decrease “Darkness” or slices. Once you’ve made your settings, press the “START/CANCEL” button and the Element IQ system will automatically display the needed cooking time on the LCD display. The Element IQ system takes your “Darkness” level and number of slices together with the internal temperature of the oven and determines how much cooking time is needed. This mode uses all four elements to cook frozen or fresh pizza while crisping the top layer. The middle rack position is recommended for Pizza mode, but you may need to adjust based on the thickness of the pizza and other components. The default temperature and time in Pizza mode is 425 degrees Fahrenheit and 15 minutes. The frozen foods button, indicated by the snowflake icon inside the button is also selected by default. To change the temperature or time, press the Temp/Time button until either the default temperature or time is displayed on the LCD screen. Then rotate the dial left or right to decrease or increase the temperature or time. You may choose temperatures between 120 and 450 Fahrenheit or 50 and 230 Celsius. Time can be adjusted from 1 minute to two hours in Pizza mode. Note: If you are cooking fresh pizza, deselect the frozen foods button by pressing the button with the snowflake icon inside of it, the snowflake icon will also disappear from the LCD display if you deselect it. Once your settings are made, press the “START/CANCEL” button and the oven will preheat to the temperature that you’ve set. When the temperature is reached, an alert will sound for you to put the pizza in the oven. If you are using a pizza stone, put the pizza stone in the oven during preheating since it needs to warm up before you put the pizza on it. Once the cooking time has been reached an alarm will sound. This mode is designed to cook fresh or frozen, homemade or commercially prepared cookies, crescent rolls, cinnamon rolls, strudel, biscuits and similar foods. It is suggested that you use the middle rack position in Cookie mode. When you select Cookie mode, the default temperature is 350 degrees Fahrenheit and the default cooking time is 11 minutes. To change these settings, just press the Temp/Time button until the temperature or time is displayed on the LCD screen. Turn the dial left to decrease the cooking time or temperature and turn it right to increase cooking time or temperature. You may choose a cooking time anywhere from 1 minute to 1 hour. Cooking temperatures between 120 degrees and 450 degrees Fahrenheit, or 50 degrees and 230 degrees Celsius can be made in Cookie mode. To start cooking in Cookie mode, press the “START/CANCEL” button on the front of the oven. The oven will then begin preheating to the temperature that you’ve set. Once that temperature is reached, an alert will sound, telling you it’s time to put your cookies or other food into the oven. Once the time you set has expired, the alert will sound again. The Compact Smart Oven comes with a 10 inch by 10 inch enamel broil rack and a 10 inch by 10 inch baking pan. Also note that this BOV650XL includes a crumb tray located underneath the oven door. With the oven door shut, just pull the tray out to remove any crumbs that may have accumulated during cooking. The top of the oven has a ribbed surface that is designed to act as a warming tray, so be careful since it gets hot! You should only use ceramic plates or the optional Bamboo Cutting Board on the warming tray. The Compact Smart Oven interior 12 inches wide, 12 inches deep and about 5 1/2 inches high, or about 0.46 cubic feet total. When you deduct the interior space for racks and heating elements, then the height is about 4.25 inches, or about 0.35 cubic feet. The exterior measures 17 wide, 15 inches deep and 10 inches high. The Breville Compact Smart Oven BOV650XL weights 15 pounds. This size is great for the countertop to complement your full sized range or oven. You may even be happy with the Breville Mini Smart Oven with all of it’s cooking versatility in place of a full sized oven. If you’d like to see this oven in the store, take a look at it on Amazon here. We recommend buying an extended warranty for this oven, Amazon has some reasonable options too. The standard Breville warranty is only for 1 year, so an extended warranty is recommended to protect you if this oven stops working after that 1 year. 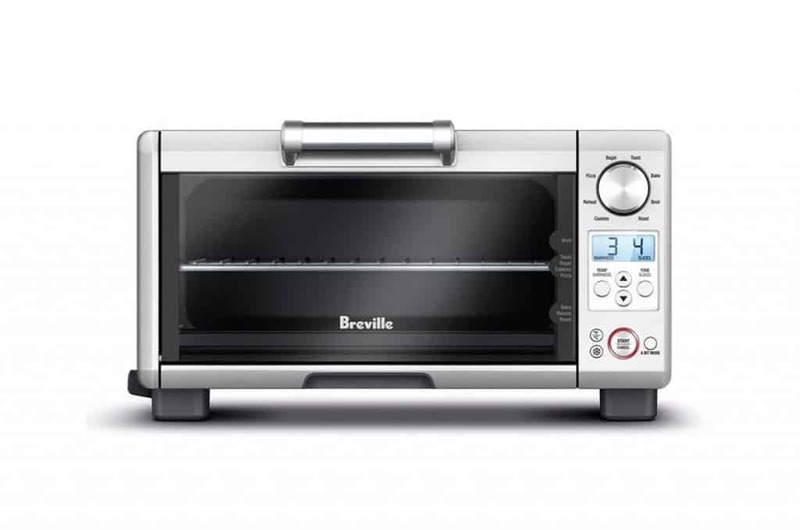 The Breville Mini Smart Oven, also known as the BOV450XL, is a compact powerhouse. Like all of the Breville countertop ovens reviewed here, it has Breville’s Element IQ cooking technology to power the oven’s four quartz heating elements. To skip straight to Amazon click here. Depending on the cooking mode selected, the Element IQ technology will adjust power to optimize the heating elements to match the mode selected. It even has a “A BIT MORE” function that adds extra cooking time to each cycle if you’d like to cook a little bit longer. The extra cooking time for this button varies from cooking mode to cooking mode. Other built-in functions that you can use in all modes are the Frozen Foods and Temperature Conversion buttons. The Frozen Foods button will add extra cooking time for each mode to account for foods that are frozen when put in the oven. It works in the Bake, Bagel, Toast, Cookies and Pizza cooking modes . The Temperature Conversion button converts recipes in Fahrenheit to Celsius and vice versa. Simply enter the Fahrenheit or Celsius temperature (you can tell which mode your oven is in by the “F” or “C” symbol on the display). Then press the Temperature Conversion button and the correct Celsius or Fahrenheit temperature will be displayed. This smallest Breville smart oven reviewed here has a lot of features. It has 8 cooking modes and a built-in warming tray on top of the oven. It also has 1,800 watts of power and an interior light. The Mini Smart Oven also has a pull out crumb tray, located under the oven door, for easy cleaning. It will also automatically shut itself off if you forget! Included with the oven is a 10 inch by 10 inch baking pan. It also has three rack positions and will even fit an 11 inch diameter pizza. Like every other oven reviewed here, the Breville BOV450XL is made of stainless steel construction. It also has a non-stick interior like all of the Breville ovens reviewed here. One thing to note, however, is that this oven does not have an interior fan for convection cooking. The interior “box” measures 0.45 cubic feet. This mode uses all 4 heating element to bake cakes or savory items like frozen lasagna or pot pies. The default temperature setting is 325 degrees F and the default time is 30 minutes. You may choose to set any temperature in Bake mode from 120 to 450 degrees Fahrenheit or 50 to 230 degrees Celsius. Once you’ve made your settings, the oven will preheat to your desired temperature and alert you when it’s ready. The cook time that you’ve set will then begin. You can interrupt the cooking cycle at any time. You can also use the “A BIT MORE” button to extend cooking time by 5 minute increments in this mode. The total cooking time allowed in Bake mode, whether it is set at the beginning or extended by the “A BIT MORE” button, is 90 minutes. This mode uses all of the heating elements to cook thick pieces of meat thoroughly while crisping the exterior, and also works for cooking denser vegetables or other foods. The temperature is set by default in this mode to 350 degrees Fahrenheit and cooking time is set for 1 hour. You may select a range of temperatures in this mode, just like in Bake mode, from 120 degrees Fahrenheit to 450 degrees, 50 degrees Celsius to 120 degrees. The “A BIT MORE” button in Roast will extend the cooking time in 10 minute increments. Like the Bake mode, the Roast mode will only allow you to cook for up to 90 minutes, whether set at the beginning or extended with the “A BIT MORE” button. Most of the power in this mode is mostly directed by the Element IQ system to the top two elements. Broil is designed to sear or crisp anything you put in the top rack position (the recommended rack setting) or middle rack for larger food. This mode is great for putting a sear on meat, crisping open faced sandwiches, or even adding a crisp exterior to bread or muffins. There are only two temperature settings is Broil mode, “HI” and “LO”. The default setting is HI and the default Broil time is 15 minutes. You may set the Broil time to a maximum of 20 minutes given the high temperatures produced. The A BIT MORE button will extend Broil time an additional 2 minutes, up to 20 minutes total, at which point it will shut off. This mode is designed to reheat food that you’ve already cooked by warming each element on the top and bottom of the oven. The default temperature for Reheat mode is 325 degrees Fahrenheit, but you may choose any temperature from 120 degrees to 375 degrees Fahrenheit or from 50 to 190 degrees Celsius. The “A BIT MORE” button extends cooking time in 5 minute increments up to 2 hours. The default Reheat time is 15 minutes, but you may choose to Reheat for up to 2 hours. This maximum time of 2 hours includes any additional time you may have chosen with the “A BIT MORE” button. This mode uses all four heating elements with the Element IQ system to toast up to 4 slices of bread. Each side of the bread will be toasted to whatever level of “browning” you select. While each side of your bread is toasted, Toast mode is designed to leave the inside of the bread soft. Element IQ will even adjust cooking time for the heating elements based on the internal temperature of the oven. If the oven is already warm, for instance, the system will adjust for that by using less power than if it is at room temperature. The middle rack is recommended for Toast Mode. In this mode, you may choose the “Darkness” levels for your toast and how many slices you want to toast. For “Darkness” levels, or levels of “browning”, you may choose levels from 1 to 7. 1 is the lightest level and 7 the darkest. Just press the TEMP/DARKNESS button until “DARKNESS” is displayed on the LCD screen. The choose your preferred level by using the up and down arrow button immediately to the right of the TEMP/DARKNESS button. To choose the number of slices you want to toast, select the TIME/SLICES button until “SLICES” is displayed on the LCD screen. Then use the up and down arrows to the left of the TIME/SLICES button to select from 1 to 4 slices. These selections, combined with the internal temperature of the oven, will automatically adjust the cooking time with the Element IQ system. Should you prefer to toast longer, the “A BIT MORE” button in this mode will extend cooking time for 30 seconds. You may repeatedly use the “A BIT MORE” button in this mode up to a total of 10 minutes Toast time. This function is designed to use all of the heating elements to brown the top of bagels or other thick slices of bread while lightly warming the bottom. If you prefer your bagel crisped equally on both sides, then just use the Toast mode. It is recommended that you use the middle rack position for Bagel mode. This mode is similar to Toast mode, you choose the level of preferred “Darkness” for the top of your bagel, from 1 to 7 and the number of bagels you want, from 1 to 4. For “Darkness” or number of slices, just press the TEMP/DARKNESS button until “DARKNESS” is displayed on the LCD screen, or the TIME/SLICES button until “SLICES” is displayed. Use the up and down arrow buttons between the TEMP/DARKNESS and TIME/SLICES buttons to adjust darkness levels or number of slices. Once you’ve made your darkness selection and chosen your number of slices, the Element IQ system will determine cooking time. The default darkness level is 4 and the default slices is 2. Should you want to extend cooking time in Bagel mode, the “A BIT MORE” button will extend cooking time for 30 seconds each time you press it. The maximum cooking time in Bagel mode, however, is 10 minutes. This includes cooking time extended with the “A BIT MORE” button. This mode is designed to use all the heating elements to cook pizza. The Element IQ system will direct more power to the top elements when in this mode to crisp the top. The middle rack position is suggested for this mode. But you may need to use other rack positions for specific types of pizza. In Pizza mode the “Frozen” button is automatically selected, indicated by the snowflake icon in the LCD display. You may press the button with the same snowflake icon to deselect it if you want to turn it off. You might want to do this if you are cooking fresh pizza. The default temperature in Pizza mode is 425 degrees Fahrenheit. You may set it anywhere from 120 degrees Fahrenheit to 450 degrees (50 to 230 degrees Celsius) in Pizza mode. Cooking time in Pizza mode is 18 minutes by default. You may choose a cooking time anywhere from 1 minute to 55 minutes. The “A BIT MORE” button in Pizza mode will extend cooking time in increments of 5 minutes. The maximum total cooking time is 55 minutes in this mode. You may want to rotate your pizza halfway through the cooking cycle for more even cooking in this oven. NOTE: If you are using a pizza stone, make sure you heat the pizza stone by itself first, during the preheating cycle. Do this before you put the pizza on the pizza stone. This mode is designed to bake homemade cookies or commercial cookies. It also works for biscuits, crescent rolls, strudel and even cinnamon rolls. Cookie mode uses all of the oven’s heating elements. The middle rack position is recommended for Cookie mode. The default temperature in Cookie mode is 350 degrees Fahrenheit, or 175 Celsius. You may, however, choose any temperature between 120 and 450 degrees Fahrenheit. The equivalent Celsuis range is between 50 and 230 degrees. Cooking time in Cookie mode is 10 minutes by default. You can change the time from 1 minute to 55 minutes total cooking time if you want. Your cooking time starts once the preheating cycles finishes. The alert will sound to let you know that the oven is at your set temperature. Using the “A BIT MORE” button in this mode extends cooking time by 2 minutes each time you press it. Use it when you want to cook longer. The maximum cooking time in Cookie mode is 55 minutes. This maximum applies whether set initially or extended with the “A BIT MORE” button. The top of the oven is designed to be used as a warming tray, but only with ceramic plates. Be careful not to place anything else on top of the oven that is not ceramic. The top of this oven will get really hot. (1) a 9 inch by 9 inch baking pan, (2) a 7.5 inch by 11 inch baking pan, (3) a standard sized 6-cup muffin tin and (4) a 9 inch loaf pan. 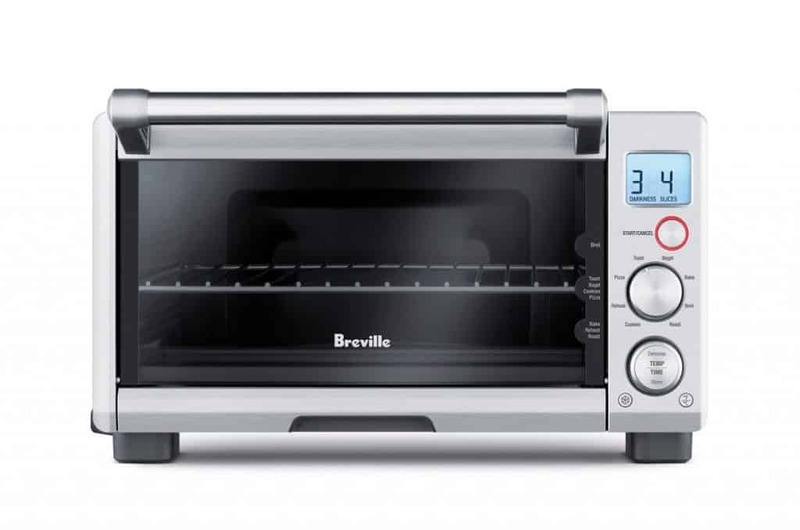 The Breville Mini Smart Oven BOV450XL weighs 15.2 pounds, and the exterior measures 15.5 x 14 x 8.8 inches. The interior measures 11 x 11 x 6 inches, or about 0.45 cubic feet. When deducting for racks and other items, the height is 4.25 inches, providing a usable interior space of about 0.30 cubic feet. What Next For The BOV450XL? The one downside to Breville ovens is their short warranties. This oven only has a 1-year warranty, so we recommend buying an extended warranty when you buy the oven. To see this oven on Amazon, included extended warranty options, click here. And The Best Countertop Convection Oven Overall? It is hard to compare all of these ovens. They each have a wide range of functions, price, warranty and quality. The Wolf Gourmet is the most expensive countertop reviewed here. But, it is likely to last the longest because of its quality. One of the less expensive countertop ovens, the Breville Smart Oven Pro, also has some of the most features. People love their Breville ovens, even if they have only a 1-year warranty. The Wolf Gourmet is the best premium countertop and the Breville is the best lower priced countertop. Of these two, the Wolf Gourmet is the ultimate winner. Divide the price of each oven reviewed here by the number of years each oven will probably last (the cost per year). That number will be lowest by almost any scenario for the Wolf Countertop. Even if it’s the most expensive, it’s still the best value if you don’t plan to throw your oven away after 2 or 3 years! The Wolf Gourmet’s quality, in our opinion, is worth the price and the 5-year warranty confirms it! You don’t need an extended warranty with Wolf Gourmet. That’s not the case with other countertops since their warranties are shorter and they won’t last as long. For almost every other countertop oven reviewed here you should buy an extended warranty that will add to the total cost. To see latest pricing and any discounts on Amazon, the models with red knobs, black knobs and stainless steel knobs, subject to availability (you can always swap out knob colors later).